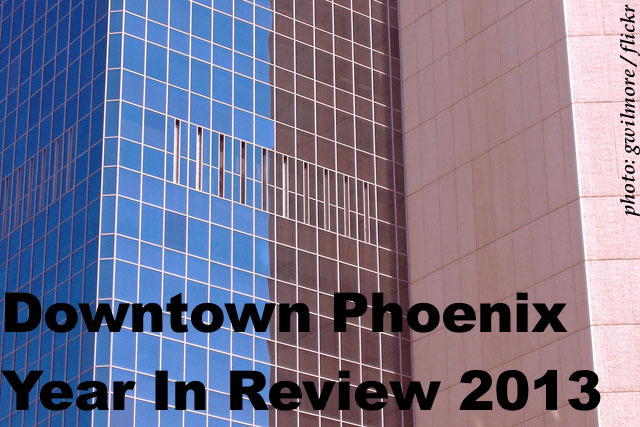 As 2013 winds down, let’s look back on the year that was in downtown Phoenix. In this third post of four, I’ll look at downtown Phoenix’s threats. In these past couple weeks, I’ve been thinking about the things that have happened in 2013 in downtown Phoenix and how they shape its present as well as the next year in our community. Yesterday, I discussed downtown’s weaknesses; in the finale tomorrow, I’ll share my assessment of downtown’s opportunities. On Thursday, I discussed downtown’s strengths. In the traditional SWOT (strengths, weaknesses, opportunities, and threats) analysis, on which this quartet of posts is modeled, a weakness is defined as something of internal origin that is harmful to organizational mission. I had a difficult time categorizing items that are weaknesses or threats (external origin) so this afternoon’s post should be read in concert with yesterday’s post. 1. Fallout from 2nd Street / Knipe House RFP — Like any good project downtown, the saga has been documented in many blogs, tweets, and Facebook posts. (NB: I was retained by one of the proposing teams for the original RFP to provide technical advice.) I won’t chime in too much on the topic because of that involvement but I know that time will certainly tell what happens with the project and how it might impact the Roosevelt Street district. There has been a petition launched by one of the main people behind one of the non-selected projects to call on the City to reject the selected project. Tempers and tensions are very high, understandably, but I hope the language being used surrounding this project (e.g., “the end is nigh for Roosevelt and downtown Phoenix”) is brought to a more civil — and reasonable — level. 3. Phoenix’s Community & Economic Development Department (CED) Asleep at the Wheel — In 2013, we’ve learned of several major economic development projects that have gone to Phoenix’s suburb cities: a major Apple component subcontractor locating in southeast Mesa, State Farm and USA Basketball to Tempe, among others. No mention was made of Phoenix, especially downtown Phoenix, even being in the running for these major endeavors. If not, where was CED? And, if so, what broke down? 4. Location and Site of “The Pin” — To great relief, it’s been announced that the proposed “The Pin” observation deck at Heritage & Science Park will not be happening. This is a good thing, right, so why is it on the threats list? People involved with “The Pin” have been scoping out other sites in downtown including, perhaps, as part of Hance Park’s redesign. I would hope that this project has seen its last light: I am not a fan.